As we continue our series on the “Ancestry of the King James Version” by looking at books it contains that the modern Evangelical NIV does not we come to Judith. 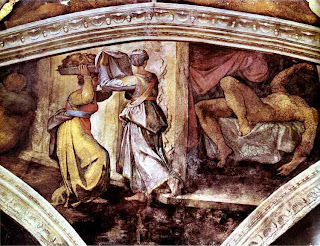 Judith is a wonderful example of moral story telling by an early Jew. The author tells of the story of a contest between a dominant pagan culture with its attendant claims and the God of Israel. Yahweh gains victory through a very unlikely source. Judith, a pious widow, uses her wiles to save her people and the Temple from the pagan Assyrians. The tale from beginning to end reinforces the basic theology of the Hebrew Bible (especially that of Deuteronomy). Judith is presented as a model of piety and faithfulness to the covenant of grace, affirming the efficacy of prayer and confidence in the God of Abraham, Isaac and Jacob. On the face of it, Judith is set in the sixth century B.C. But it is readily apparent that the book does not date from that time period. The book was written in Hebrew sometime after 200 BC and likely toward 100 BC (Carey A. Moore, Judith: The Anchor Bible Commentary, pp. 66-67; 68-70). The book includes references to exact periods of time, real places and other matters characteristic of historical narrative. Finally, the plot is simple and straightforward enough for it to be fact rather than fiction. “Perhaps in the end we will come out approximately where Shakespeare did: Hamlet and Lear were real people, but the plays have little to do with factual history, and the story and characters in the plays have a life of their own which bears little resemblance to the original historical figures, or the various historical characterizations in the sources which Shakespeare used.” (quoted in Moore, p. 49). There are many examples of “real” people who are fictionalized into legends – even almost overnight. For example John Greenleaf Whittier’s account of how Barbara Frietchie defied Stonewall Jackson as his soldiers tried to prevent her from displaying the American flag as they marched through Maryland. Luther was conscious of the historical “problems” in Judith, despite this he holds it to be a “noble and fine book.” In fact for Luther the historical issues are not that serious at all for he holds the book is intended as a “beautiful religious fiction.” He thinks that the work may have been intended to be a sort of drama along the lines of some Greek plays. He writes. “Therefore this is a fine, good, holy, useful book, well worth reading by us Christians. For the words spoken by the persons in it should be understood as though they were uttered in the Holy Spirit by a spiritual, holy poet or prophet who, in presenting such persons in his play, preaches to us through them” (“Preface to the Book of Judith,” Luther’s Works, vol. 35, pp. 338-339). Judith falls into two basic parts. The first part describes the war of the Assyrians against the Jews (chapters 1-7); the second relates the deliverance wrought by God through Judith (chapters 8-16). Hostilities had broken out between the Assyrians and the Medes. Nebuchadnezzar, who is pictured as ruling the Assyrians, calls on the western nations to help him against his enemies, however, they refused (1.7-11). Angry and vowing to take revenge on them – including the Jews. After defeating the Medes (1. 12-16) Nebuchadnezzar decides to destroy those who sought his downfall in the west. He sends out his General, Holofernes, with 120.000 men and a further 12,000 cavalry. Soon the nations were frightened into submission. Meanwhile in the village of Bethulia the citizens, fearful that the Assyrians would defile the holy Temple of God, decide they will not acquiesce to Nebuchadnezzar. They store provisions in anticipation of siege. They seek God’s favor through prayer and fasting in sackcloth (4.1-15). After thirty four days, however, with supplies running low the inhabitants of Bethulia began to loose heart and call upon the city elders to surrender to the Assyrians. A leader, Uzziah, plead with them to hold out five more days, “By that time the Lord our God will show us mercy, for he will not forsake us utterly” (7.30). Nevertheless, he agreed to capitulate to the Assyrians should help not come (7.19-32). “Listen to me, rulers of the people of Bethulia! What you have said to people today is not right; you have even sworn and pronounced this oath between God and you, promising to surrender the town to our enemies unless the Lord turns and helps us within so many days. Who are you to put God to the test today . . .You cannot plumb the depths of the human heart or understand the workings of the human mind; how do you expect to search out God, who made all these things, and find out his mind or comprehend his though?” (8.12-14). Judith volunteers for a dangerous mission – to be used by God to defeat the mighty, arrogant and pagan Assyrian army. She prays. She emphasizes her weakness and her vulnerability but also expresses amazing confidence in the God who is “God of the lowly, helper of the oppressed, upholder of the weak” (9.11). She concludes her prayer by bringing to expression the main issue, her (and the author) the manifestation of who truly is God in this world (9.14). Judith ends up using Holofernes arrogance, and his desire for her beauty, to bring him down. Thus in one of the most painted scenes in western art, Judith decapitates a drunken Holofernes. Judith frankly acknowledges, “It was my face that tricked him to his destruction, and yet he committed no act of sin with me, to defile or shame me” (13.16). Thus God wrought a powerful victory through the most unlikely of ways for his people. It is a delightful story with a powerful message. A number of biblical books make effective use of the narrative technique of irony. But author of Judith seems to have based his entire story on this art form. Irony, as Moore notes, is the “key to the book” (Carey A. Moore, Judith: The Anchor Bible, p. 78). Irony is difficult to use because one typically means the exact opposite of what is said. One who has a too literal a mind set often runs the danger of missing the irony an author wishes to intend. For example when Judith is brought into the presence of Holofernes and he demands she explain her mission to him she “beguiled” him by using words that carry a double entendre: “If you follow out the words of your maid-servant, God will accomplish something through you” (11.6). The reader knows full well what God is going to “accomplish” through this arrogant pagan General – not the conquest of Bethulia as he imagines but the liberation of the Jews by his own death. The whole story of Judith is ironic from beginning to end. She, a childless widow, gives spiritual and physical life to her people. She is wealthy woman lives so simply that she almost starves herself. In a society where women did nothing at all she enters into the “man’s sphere” with great success (and through God’s help). She is soft, feminine, and vulnerable yet capable of taking Holofernes head off. And the sword slashed through his neck! (16.9). The would be ravisher is ravished and killed. Though no one thought of this in the ancient world some moderns (particularly some well meaning, but special pleading, Protestant apologists) have questioned the morality of Judith’s killing of Holofernes. While decapitating a person is indeed a violent and bloody affair I would hold judgment in abeyance. There can be little doubt that the model or “inspiration” for presenting Judith’s victory is the narrative of Jael and Sisera in Judges 4 and 5. The parallels in the stories are remarkable to say the least (see Sidnie Ann White’s “In the Steps of Jael and Deborah: Judith as Heroine” in No One Spoke Ill of Her: Essays on Judith, ed. James C. Vanderkam, pp. 5-16). It will be recalled in that story (Jael and Sisera) that Sisera is a general (like Holofernes). He is invited in, gets drunk on milk (it wasn’t chocolate! 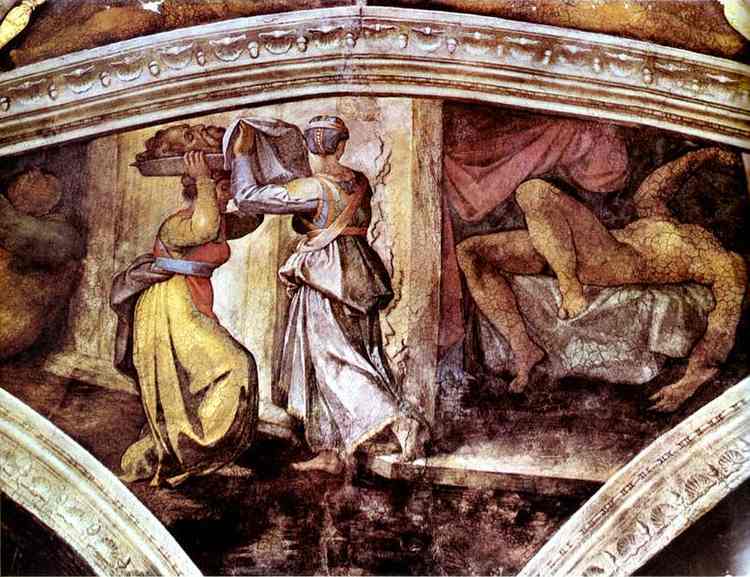 ), and in his sleep Jael takes his life by driving a tent peg through his temple. This is followed by a great hymn (as in Judith) in chapter five of Judges. Now Jael is not the inspiration for our author’s story but it is the inspiration for how he choose to tell the story. The best resource for understanding this aspect of Judith as its original audience would is David A. deSilva’ outstanding essay “Judith the Heroine? Seduction and Murder in Cultural Perspective” in Biblical Theology Bulletin 36 (Summer 2006): 55-61. Kept in her historical (and biblical!) context, Judith emerges powerfully as a “Delilah for the cause of God … a model for the pious and rigorous observance of the holy covenant, an example of the power of prayer when joined with faithful action, and a proof of the power of God” (p. 60). The failure of Judith to achieve canonical status among post-Temple rabbis and Judaism, despite the deep piety and presence of God in the book, has baffled many scholars in recent years. This is all the more surprising because Esther, in its Hebrew form, never even mentions God! But when the chips are down the actual process of canonization is shrouded in mystery and we simply do not know why Judith failed to make it into the rabbinic canon. However, we must not assume that the book was not treasured by the Jews for such a conclusion would be false. The book became associated with Hanukkah being read for centuries during that festival. “Woe to the nations that rise up against my people! “You cannot plumb the depths of the human heart or understand the workings of the human mind: how do you expect to search out God; who made all these things, and find out his mind or comprehend his thought? (Judith 8.14). Both contrast the “depths” of a person with the “depths” of God. Both use the peculiar terminology eraunto (search out) and bathos (depth, deep things). There is a strong likelihood that Paul uses the language of Judith to shape his own thinking at this point. “Many women being strengthened through the grace of God have performed many manly deeds. The blessed Judith, when the city was beleaguered, asked of the elders that she might be suffered to forth into the camp of the aliens. So she exposed herself to peril and went forth for love of her country and of her people which were beleaguered; and the Lord delivered Holofernes into the hand of a woman” (1 Clement 55, The Apostolic Fathers, p.36). The text of Judith is quoted by a number of second century writers like Origen and Clement of Alexandria. Clement, a Christian in Alexandria in Egypt, lived about 160 to 215 A.D. He quotes Judith several times in his book, Stromata (written around 190). In Book IV he summarizes her story while mentioning Esther and Susanna too. Clement had been talking of overcoming our passions and holds Judith up as an example (see Ante-Nicene Fathers, vol. 2, p. 431). “Biblical” literature has exercised a profound influence in Western culture, Judith is hardly an exception. Indeed cultural historian Margarita Stocker (of Oxford University and Hilda’s College) has argued that Judith has functioned as an “enduring cultural myth in western society.” Stocker invites us on a magical mystery tour, a thorough analyses of literary, artistic, cinematic and popular culture sources in her scholarly yet readable tome with the catchy title Judith Sexual Warrior: Women and Power in Western Culture (Yale University Press, 1998). It is truly fascinating to see how and in what ways biblical stories have been used in our culture. If you ever meet a Judy her name goes back to this Jewess hero. This entry was posted on Monday, July 11th, 2011 at 11:06 pm	and is filed under Apocrypha, Bible, Exegesis, Faith, Jewish Backgrounds, Judith, King James Version, Septuagint, Women. You can follow any responses to this entry through the RSS 2.0 feed. You can leave a response, or trackback from your own site. Judith 16:17 is the earliest even deutero-canonical reference to unending conscious torment — which is not mentioned in the OT or (I argue) the NT. She clearly is borrowing terms from Isaiah 66:24 (which Jesus quotes in Mark 9, not Judith). But she totally changes Isaiah’s imagery in the process: from corpses to living people; from external worms and fire to internal; from consuming to tormenting; from shame to pain. Sadly,the greatest part of the Christian Church eventually followed Judith’s picture(not knowingly or directly) instead of Isaiah’s. This is an interesting and enlightening series you’ve been doing. Thanks for sharing it. Thank you Randall. I am delighted you are finding value in them. Brother Fudge it is great to have you reading and commenting. I think Judith’s change from the dead to seeing living people judged on “judgement day” (NJB) is probably consistent with the growth of intertestamental ideas however. I do think, however, that two ideas are debatable regarding the interpretation of Judith 16.17. First I think it is up for question that the author really moves significantly beyond Isa in conceiving this as punishment AFTER DEATH (emphasis not yelling :-). No where else in the book is there any discussion of the afterlife (not even in Judith’s prayer in ch. 9). Also the phrase eos ainos has the flavor of what Moore calls “rhetorical flourish.” Its poetry not a propositional statement. Thus as I read the text I do not see Judith as promoting a doctrine of conscious eternal torment … its a possible reading of the text but I do not think it is a necessary reading or even likely. But I have been wrong before. Blessings my brother.